but took time out to discuss his visions for the future. The road to the mayor’s office is usually paved by an “apprenticeship” as a councillor in local government. This is where a political novice can absorb the lessons of that position, then potentially apply them in a bid for the municipalities top political position. But Scugog’s new mayor, Chuck Mercier, travelled an exceptionally different route – starting his career in municipal politics at the top. Although the path he chose may be unconventional, even controversial, the new mayor’s preparation was equally intense and thorough. Seven years in the Homicide Division of the Durham Region Police Service (DRPS) provided ample grounding in long and irregular working hours, while a later promotion to the force’s Executive Branch laid a solid foundation in administration. Another aspect of those administrative duties, he explains, which will serve him well as Scugog’s mayor as he seeks to create effective compromises among councillors. “That (policing) job required a great deal of problem-solving, so I learned how to sort out where the real issues lie and work toward an outcome which will satisfy all stakeholders. In my experience, the majority of solutions are found ‘at the centre line’ – the middle ground – and most people are willing to work toward compromise. This skill set may have prepared him well for his current role, but candidacy for mayor was not listed on Chuck’s agenda when he retired from DRPS in 2009. Chuck’s agenda for his early weeks in office will ring true to anyone who has assumed new job responsibilities. He wears his passion for the community on his sleeve. Chuck’s love of community began with small-town roots and an innate desire to serve. “I was born in Timmins, grew up in Elliot Lake,” he says. “When I moved away (to pursue post-secondary studies in Law and Security Management), I chose Loyalist College in Belleville. 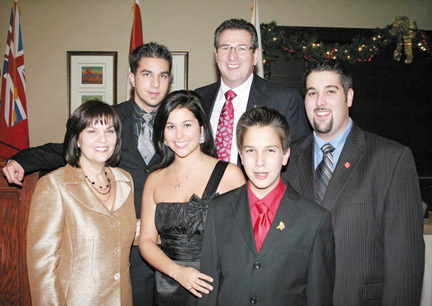 And when it came time for Paula and I to raise our family, Port Perry was our clear choice. Her family had deep roots in that community and its small-town feel was just my style. and Mike. Photo courtesy the Mercier family. Chuck and Paula, his wife of 28 years, have raised four children in the community: a daughter, Sara, 25; and three sons, Michael, 26, Jesse, 18, and MacKenzie, 14. The family skis and attends church together - not surprising, locally. Chuck’s positive attitude permeates his statements about policing, politics, and community. It’s an outlook, he says, he and Paula taught their children. “I wanted them to think of everything as an opportunity, and I live by that philosophy myself. There’s certainly no trace of indifference in Chuck Mercier, police officer turned politician. And there’s no hint of intimidation at assuming a demanding role in a much different arena. In fact, there’s every indication he can’t wait to get started. 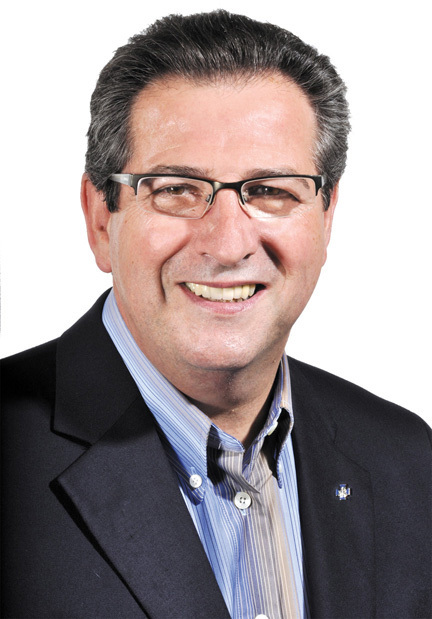 He may have come to the Mayor’s job along an unconventional path, but you get the strong sense that political newcomer Chuck Mercier is going to fare just fine. 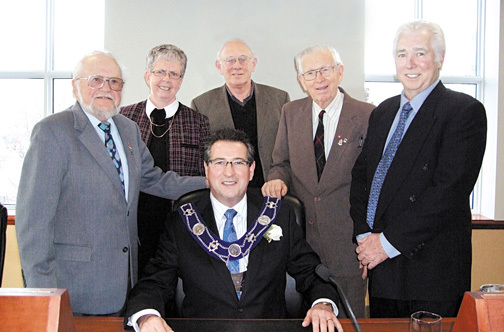 Scugog Township’s new council was sworn-in on Tuesday, December 6. 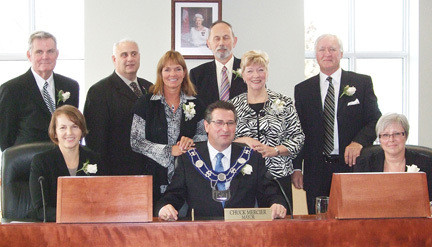 Front left, Bev Hendry, CAO, Mayor Chuck Mercier and Kim Coates, Clerk. Back left, Larry Corrigan (Ward 1), Jim Howard (Ward 3), Wilma Wotten (Ward 4), John Hancock (Ward 2), Bobbie Drew (Regional Councillor) and Howard Danson (Ward 15).